It is Wednesday, so only a snippet of a blog about a few things that caught my interest recently. Words have meaning and concepts have meaning. That is, until you are a social democratic politician in Europe. Then meaning goes out the window as does mission – unless the mission is power at all costs. Social democratic values and views do not resemble neoliberal economic or right-wing social agendas at all. Yet in the hurly burly of European and British politics that is what has been happening. Across three nations (Sweden, Germany and Britain) we have seen this trend in the last few days. The claim is that it is clever politics to shift into the ‘centre’ and take back voters from the conservatives. The problem is that the centre moved significantly to the right over this neoliberal era. Now we have so-called progressive politicians who three decades ago would have looked like conservative right-wingers. It is not clever politics at all. They just lock themselves into positions that make it very hard to pursue true progressive policies. Meanwhile, the people they claim to care about are forced to endure damaging economic policies. Stupid all round. We have a political agenda today which is in some sense is authoritarian. Yes, Anti-Migrant, strong on law and order, faster integration (abandonment of multiculturalism). Safety has been reduced and a new type of criminality is attempting to take root. So instead of announcing large-scale job creation to redress the disadvantage and poverty endured by new migrants, the social democrats in Sweden are going in the opposite direction. More police to bash them and lock them up. The social democrats certainly have their fingers on the pulse! Meanwhile, I saw the latest INSA/YouGov poll of voting intentions in Germany this morning. You can download the entire dataset – HERE. This graph shows the movement in voter intentions from September 28, 2009 to the latest poll on February 5, 2018. 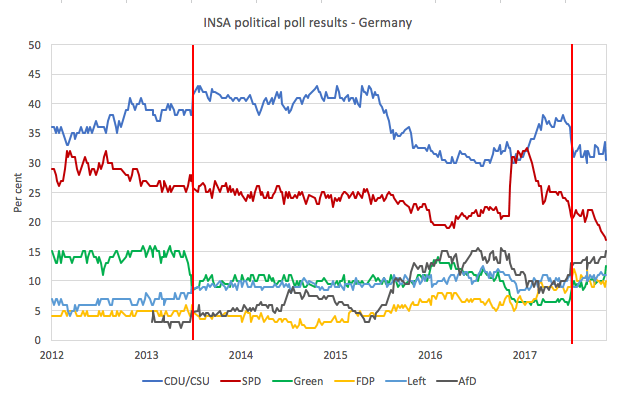 I have left out a few of the smaller parties which have either been stable in attracting voter preference (for example Sonstige Parteien, which gets around 3 or 4 per cent) or have not featured in recent polls (for example, Piratenpartei Deutschland). The vertical red line denotes when the general elections were held. The patterns are fairly clear. The loss in SPD (under Martin Schulz) is stunning. The blip in support upwards before the election was an anomaly. SPD have been trending down for the last 6 years and are now at historic lows. The February 5, 2018 poll found that they attracted just 17 per cent of the voters, whereas the hard-right party AfD are up to 15 per cent. There is only 2 per cent gap between them. That is a remarkable shift in the political terrain and demonstrates the bereftness of the social democratic political movement in Germany. By playing along with Merkel’s conservatives and pushing a strong Europhile sentiment, the SPD has opened the door for the AfD, which is exploiting the hardships that people are feeling as a result of Germany’s economic policies among other things. Meanwhile, in the UK, Labour leader Jeremy Corbyn thinks it is useful to pump out fake knowledge to win votes. He tweeted this on Monday (February 5, 2018). I know Donald Trump is using Twitter to pump out lies but I would have thought Jeremy Corbyn would do better. Whoever is advising him needs to be sacked and Jeremy Corbyn needs to start telling the truth to the British people. Who knows, he might just shift the debate a bit in the direction he favours. And the 2,812 people who liked this Tweet need to reassess their understanding (or total lack of it) of macroeconomics. I know that many will say that Jeremy Corbyn is just neutralising issues politically to make points that will gain him popularity. But that is a tired old line. By playing the neoliberal macroeconomic card and playing along with the neoliberals the progressives just corral themselves into spaces that they can never get out of. They end up having to abandon a progressive agenda and looking like the conservatives. It is not a smart long term political strategy at all. Our latest book, Reclaiming the State: A Progressive Vision of Sovereignty for a Post-Neoliberal World (Pluto Books, 2017) – received more favourable coverage in the French press this week. In the review section of Le Monde diplomatique article (February 4, 2018) – L’État, c’est nous (The State is Us) – Aurélien Bernier considers our book in the context of Brexit. He discusses our call for progressive governments to abandon their Monetarist/neoliberal leanings and restore a progressive path where the fiscal capacity of the government is used to advance the well-being of the people rather than serve the interests of the corporate elites. Un plaidoyer qui résonne comme un appel au Parti travailliste de M. Jeremy Corbyn à saisir une occasion historique. Which, in the context of Jeremy Corbyn’s tweet above is very apposite. Go on, Jeremy, “seize a historic opportunity” (“à saisir une occasion historique”). Just this time, do it! On the Reclaiming the State theme, I will be visiting Europe in a few week’s time. 1. Helsinki, February 27, 2018 – I will be giving 6 lectures on Modern Monetary Theory (MMT) at the University of Helsinki in late February and early March as part of a new international studies program. The first lecture will be a public event and will be held on Tuesday, February 27, 2018. 2. Barcelona, March 2-3, 2018 – I will be speaking at events organised by the Catalonian-based Ekona coop, which aims to promote innovation in the public and community sphere to move towards a new democracy. It is particularly focused in influencing the European Left to abandon their neoliberal ideas about economics. I will circulate more details soon of both events. To follow up on yesterday’s blog – The blight of the visitor economy – I took the photo this morning while I was out running around the beaches and harbour. 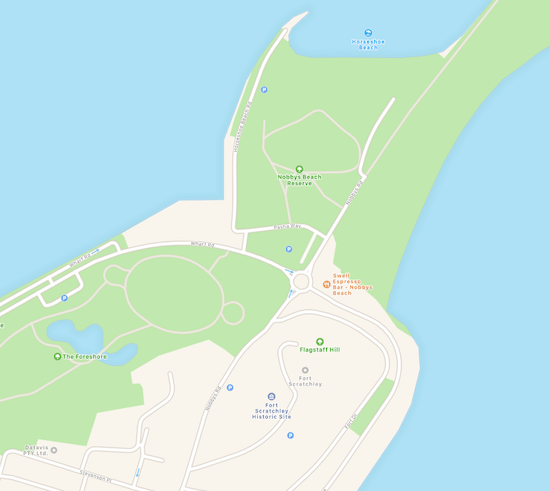 This shows what used to be called Nobbys Foreshore Park – which is 50 metres from the beach and an area that families used for picnics and other recreation while spending a day at the beach. It was regularly well patronised. Now it is no more. 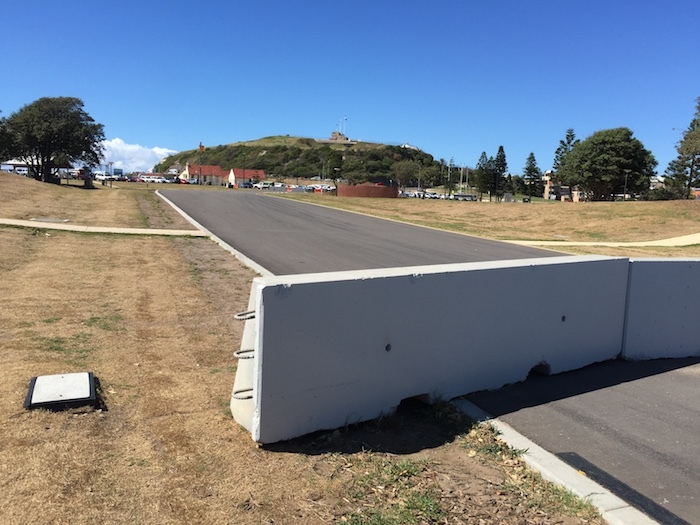 It was dug up to build a hairpin for the Supercars race and is now destroyed as a recreational space. So the citizens lost a valuable community resource and the corporation running the race made huge profits on the back of large government subsidies. That is visitor economy nonsense – it is hard to be optimistic about that – no matter how old one is or what their background is. This map shows what the area used to be like before the government handed it over to the Supercars to build their hairpin and effectively destroy the park forever. This song – Almost Blue is by the incomparable Chet Baker and was written by Elvis Costello. It is from the album – Chet Baker in Tokyo (King Records) and was recorded in June 1987. This song was taken from the concert, which was just 11 months before he died at the age of 58, lying on the street in Amsterdam after falling from his hotel room. He was a lifetime heroin addict. Sombre and flowing. He was a physical wreck by the time this concert was held but could still play exquisitely. Here is an interesting New York Times review () of the concert – A glorious moment in Chet Baker’s twilight. You can hear the whole live concert – HERE. You know it’s amazing how people don’t ask themselves the simplest follow-up questions, that could lead them to the truth. Like, who do “we” owe all this money to (the national “debt”)? Who pays the interest on the national “debt?” And so on. I was fully aware, and appreciated the point you were making in the original blog. My reference to some aspects of the growth of a “visitor economy” was merely to add a little perspective. Your contribution to the economic and social debate is not lost on me. …but as you and Steven Hails keep reminding us, paying those tax $$$ helps to fight Inflation which is detrimental to ordinary people’s lives as their standard of living gets harder and harder to maintain. I would ask you to approach Corbyn so to request that he clarifies the paying of Taxes by every dodgy Big Tax Evader is essential so to Fight Inflation, which is also a Big Threat to ordinary grassroots people in AUS, US, UK where there are sovereign currencies in charge. Corbyn must be supported so as to show he can lead the way to Socialist Democracy that is a Win-Win for us ALL! I quite agree but I think this points to a possible dilemma. If one has the JG not just for citizens but new residents, will this not become a powerful attractor for new immigrants over alternative states that do not offer such support? That might not only feed some groups xenophobia but, more importantly, IMV, might that also be used as an argument against a JG for that country in the first place? I think this is an important issue that I do hope you could address this in a dedicated post. 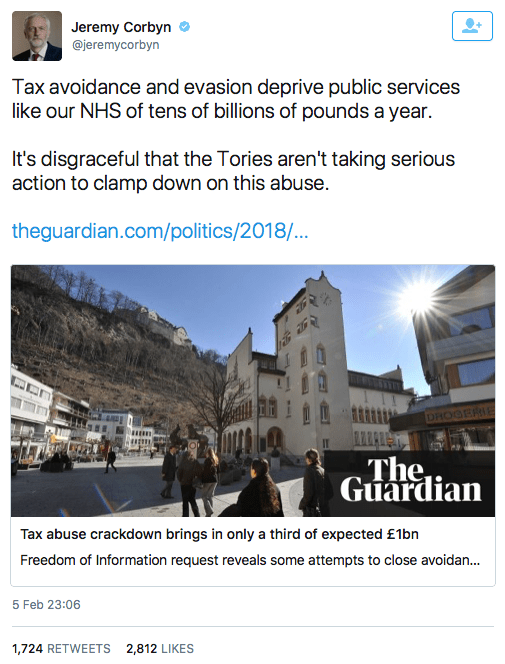 Like Jennifer I also have concerns about criticising Corbyn for sayimg tax avoidance and evasion reduces the ability of the UK government to pay for important government services. As taxes are needed to create economic space for government spending so as to avoid inflation both roads are effectively the same. Taxes also have an import redistribution role reducing inequality and thereby help to sustain consumption demand by the populace. Or putting it another way, surely it is better that the wealthy create more economic space for government spending than the less well off. I prefer to push the line that national government deficits are met by issuing new currency and that government spending ‘below’ the deficit is funded from taxation as it is easier to sell and achieves the same ends as the reality that all national government spending is met with issued currency. I am afraid educating and convincing the political class, the economic mainstream and the populace about the reality of macroeconomics will simply take too long and a few half truths will likely achieve the desired end points more easily and quickly. Economics faculties should however teach the truth. If the horse is on the track and running fast enough in the right direction then perhaps the motivations of the horse are not that important, as long as the jockey knows what he or she is doing. for your smart interpretation of MMT and how others perceive no matter how humble their economics background! MMT must be put into user-friendly terms so our peers grasp it and people like me in little old Drouin can hope to expound upon its wisdom. It doesn’t Jennifer. Excess savings have precisely the same macro effect as taxation. If the rich count their coins, there is more free real capacity for the state to use. The problem with the Robin Hood approach, is that the feudal system remains in place, and the Sheriff of Nottingham is still in charge of the gold chest. The only reason to take money from rich people is because you want them to have less money. But it is far better to alter the system so they don’t get it in the first place. Off topic but last Wednesday the BBC’s Radio 4 broadcast “Shaking the magic money tree” (http://www.bbc.co.uk/programmes/b09pl66b). This half-hour programme largely concerned QE (benefiting financial institutions and the well-off) but briefly stated that the money was created from thin air. First time I have heard such views expressed on the BBC. Perhaps your message is getting through? Gives me hope. It’s available on the BBC’s iPlayer which may not be accessible outside the UK. The MMT (and not only MMT) argument about inflation is that in a situation of full employment additional spending will cause inflation. Taxation reduces private spending and hence creates space for additional government spending. Currently we are not at full employment so taxation of the rich is not needed to control that kind of inflation. In any case the very rich don’t spend much of their income. They mostly put it into financial assets and cause inflation there but not much in the real economy. You could argue increased taxation on the rich might decrease speculation in real estate (maybe). But there are likely better ways to control real estate speculation: controls on credit and on purchases by non-residents, for example. In any case the argument about the rich and taxation is one of fairness and power. We should all pay our fair share and if the rich don’t it’s unfair. No need to incorrectly talk about funding government expenditures. With respect to power, money is power so the rich have far more power than they deserve. Reducing the size of their wealth reduces their power which is a good thing as the wealthy have skewed policy to favour themselves to the detriment of the rest of us. I too am a fan of Jeremy Corbyn but it is unfortunate that he makes statements such as the the ones Bill points to, especially as they are not necessary. It doesn’t. The power comes from their network of people they know, and that is a one way gate. Once you have the money to get through it, you’d have to completely bankrupt people to stop them having power. There is a way of doing it, Neil, but I would not recommend it. Such a move is inherently destabilizing if not worse. Prevention of accumulation is a better solution, as you say. I think Keith Newman is right. Very good comment. And of yes- money is power. There are other forms of power such as persuasion or plain old physical force, but money can often buy those also. If the very wealthy kept most of their wealth in government currency sitting in safes, then Neil would be right that their is no real need to tax them especially. But that is not what most of them do. Thanks for the clarifications especially that taxing those that horde their savings does not provide much additional economic space for government spending. I promise to save as well if the government gives me an idle billion so can I have some too? Jeremy Corbyn’s current argument for taxing corporations and the wealthy is more powerful and electorally popular (which is vitally important in a democracy) than an argument that could be developed based on a correct understanding of MMT principles is it not? Why were high rates of taxation on the wealthy such a central success of the post war settlement? You cannot be left or progressive without an egalitarian mindset. Yeah Andreas, I want a billion also, where do I sign up? I promise it won’t have much effect on the real economy so why not :). Actually, I think Neil is correct that taxing away what would only otherwise be saved does not provide much non-inflationary space for other spending. I just disagree that ‘saving’ is the best description of what most of the very wealthy do with their money. Sure it is reasonable that the wealthy keep more cash on hand than the poor but they also use their wealth to secure a greater share of the more desirable real resources out there and to exert control over how those and other resources might be used. That is power and it is something that a democracy needs to keep in check or it wont be much of a democracy. But a correct understanding of MMT allows for arguments that are even more powerful than ‘we need to take from the rich so that we can help everyone else’ type arguments, (if that is Corbyn’s argument, really I don’t know much about UK politics). MMT says that we don’t need anything from the wealthy or the corporations in order to have government policies that would keep the economy producing as much as is possible. The government never needs ‘their’ money in order to spend on what we want it to. To follow on from Jerry – inflation is due to spending, and only spending. You can limit an entity’s ability to spend in a market segment without affecting their wealth one iota, so you need to disconnect taxation from inflation because there’s no causation between the two. All well and good. But very high tax rates on very high incomes is a straight(enough)forward way of preventing them from getting it in the first place. We’ve done it before, and it seems to have worked quite well. I don’t understand the objection to high tax rates on high incomes. trickledown economics is just a fig leaf for the entitlement of the elite. elite and the rest is the goal. use that spending and taxation to mitigate the inevitable social injustices of the system. Fiscal stimulus without fiscal transfers is not social democracy. part of the relative success of the post war settlement across the developed world. I think Neil’s argument is that a government which understood MMT well enough to use its spending power fully in the interests of all sections of the population would face far less opposition from conservative and neoliberal forces, if it didn’t constantly and overtly threaten their wealth by imposing punitive higher taxation rates, either whilst campaigning, or after winning, a general election. As MMT recognises that money saved is effectively money taxed as far as its effect on inflation is concerned, then there is no *macroeconomic* reason to increase taxes on the rich, or chase up offshored wealth. In other words, if the cost of seeing the victory of a government which intends to use its power as currency user to create full employment is allowing the rich to retain their wealth at current tax rates, then it’s a price worth paying. I get Neil’s point, but I think the issue of justice being *seen* to be done is important to society; I also think that wealth is what allows the networks of the rich that Neil identifies as most powerful to be accessed and maintained, and Kevin’s point about savings being a claim on future resources is persuasive, although of course once those savings are spent, they will be taxed in the normal way. I agree that MMT exponents’ words of wisdom MUST be SEEN to be done. Just an afterthought: both taking a laissez faire attitude to additionally taxing the rich in order to defuse their opposition to MMT, and Labour’s opposite tactic of “squeezing them till the pips burst” in order to garner mainstream leftist support, both use the argument of the ends justifying the means. My concern would be that this is a tactic that can backfire in the future. I think addressing the importance of *perceived* fairness in the former case, and honesty in explaining exactly how and why taxes function in the latter (including the capacity for social engineering in addition to their macroeconomic function) would be the best approach. On a technical point: some of your pics don’t appear in Chrome. The pic of the Jeremy Corbyn tweet is there if I look at your blog on my mobile phone (Android) but nothing comes up on my laptop. I don’t disagree that there is no macroeconomic reason to tax saved money. The problem is that those savings are periodically spent down every couple of years to purchase government policy (https://www.bloomberg.com/news/articles/2018-01-29/koch-network-plans-early-ad-push-to-influence-2018-election), creating a political reason to tax. I don’t anticipate the rich ever supporting a job guarantee. They got rich by undermining labor bargaining power in the first place, so there is simply not any trade-off to be contemplated here. Getting a job guarantee won’t be easy precisely because the rich will spend down (some of) their political slush funds (what we are calling “savings”) to oppose it. Another path must be found, I’m afraid. But it’s the usual path: politically organizing working people to demand it. I believe I already said that the only reason to take money of the wealthy is because you want them to have less money. That’s the point. You don’t want to link it to anything, because that is handing your opponents a weapon. And that weapon will be, once Corbyn has finished with the rich, he’ll come after you for money. You want to get away from money. Then fairness and justice is about allocating actual resources in the country. For example if we want a fully staffed NHS, then reservation of scarce medical resources via private medicine will probably have to end. High incomes is nature’s way of telling you that your distribution system is faulty. If you have such a disparity, then your production system is likely substandard with structural bottlenecks. Similarly giving somebody something and then taking it away again causes a loss aversion response which is far greater than if they hadn’t got it in the first place. So you get greater opposition. A Job Guarantee, and then application of effective competition would rapidly sort things out structurally. I agree with everything in your response to me, but this leaves the question of how, politically, one achieves the policy goal of a job guarantee in the first place. I do not believe it is through educating the rich or appeasing them. They will always be, collectively, the political opposition to a job guarantee, because their wealth and income is based on the very distribution distortions the job guarantee will help correct. So if there’s an opportunity to make that political opposition less effective by taking their political slush funds away, it should be done, notwithstanding any loss aversion response. And it should be noted that I am talking about confiscatory levels of taxation on VERY high incomes. I’m not talking about taking money from doctors and lawyers and other skilled, working professionals. I’m not interested in making working professionals hostile to a job guarantee or a movement that supports it. I’m talking about corporate executive level, multi-million dollar annual incomes. Nobody needs to “earn” $20 million every year, and there is widespread political support for confiscating most of that. Isn’t there a very rudimentary way of resolving this clash of opinions? Namely, that tax on *unearned* income be ratcheted-up so as to be at a markedly higher rate than on earned incomes. The “euthanasia of the rentier” desired by Keynes continues to be priority number one, IMO. It serves the ends aimed-for by both sides in this argument, especially that of fairness. And incidentally, just to put the cat among the pigeons, I would advocate that bonuses be classed as unearned income – because make no mistake that’s precisely what they are. Perhaps a maximum income level (20 times the full-time minimum wage) and a maximum net worth level (200 times the full-time minimum wage) would ensure that inequality is restricted to a healthy, manageable level. I think those ratios between the highest and lowest income earners, and between the wealthiest and least wealthy individuals, provide ample scope to differentiate between people based on their level of skill, productivity, responsibility, creativity, and work ethic. Legislating those ratios would stop employers from offering ridiculously generous compensation packages to elite professionals. The highest achieving people would still be handsomely rewarded financially. The generous financial rewards combined with intrinsic motivations (their passion for what they do) would ensure that the contributions of high achievers would continue to be made. The claim that extreme inequality is necessary to provide “incentives” for high achievement has always been self-serving nonsense. We should be upfront as a society about how much inequality we are willing to tolerate and how much inequality is truly necessary to reward people for what they contribute. There would a benefit from drawing the line somewhere reasonable and enforcing that line scrupulously. I like Nicholas’ encapsulation of how salary scales should be allowed. Such prerequisites would also re-value how a range of currently unremunerated skills usually demonstrated by workers at the lower end of the scale, go without monetary value. Such skills should then have their chance to be given that monetary value. Same goes for those at the top end of the scale, who receive obscene amounts for sitting on their arses at expensive round tables making decisions after their lackeys have done the research and preparatory work. Let me make it clear I except the chartalist description of state monetary sovereignty. But this has never been a dominant position in social democracy. spending was never directly challenged by Keynes or left social democrats. for the decline of social democratic support because they never had it. springs to mind] and I think may partly account for the fall in support for social democracy. That is the irony of the discussion below the line to this blog. A sovereign state has control over the levels of immigration. I like Nicholas’s comment too. To say that no one needs to earn 20 million every year is quite an understatement. No one needs to earn 250,000 (Euros, Dollars, Pounds) per year. With greater than that sort of income people use their money for all sorts of stupid things. They use their money to go on vacations in far away places (where they can catch malaria). They buy large motorhomes (which they could drive into a low bridge with). Or they send their kids to a horseshit ivy league university (and turn their children in to zombies). So if the marginal tax rate was such that people could not earn more than 250,000 a year that tax rate would be doing the high earners a favor. It would be helping them to protect them from their own stupidity. It would not be the fault of a government that would impose such a tax rate that those who benefited from it could not understand how much better off they are because of it. Just as importantly these high earners set a life style example that everyone wants to emulate. Such life styles are not sustainable on this planet, with current technology, based on the number of people CURRENTLY living what is commonly understood as the good life. These high earners are setting a very bad, but tempting, example. Such desires need to be curbed if we want a planet that our grandchildren can live on. One possible objection to the desire to create a sustainable planetary economy is that it is already to late to do so. Well if that is really the case I myself do not want to see those who have a greater responsibilty for getting us to this point to be able to enjoy any more time on this earth. Therefore I would support a very progressive income tax anyways. As for bonuses though I do not think it is simple as to how they should be taxed. MANY bonuses are just flat out fraudulent. But if someone do come up with a new way to do something that is more environmentally sustainable they have certianly earned their bonus. At this point, I think the left have already gone off the end of the plank and are now drowning. “Progressive” seems to have been removed from the vocabulary. Thank you very much for responding, and clarifying the distinction. I completely agree with you regarding the advisable termination of private medicine, to which I would also add private education and private pensions. But would you accept that, in general, wealth is generally what enables, firstly, access to – usually via fee-paying schools and Oxbridge (in the UK) – and, secondly, the maintenance of a position in, those power networks that you rightly identify as so important? There can’t be too many *non-wealthy* individuals (or corporations) who are influential members of power networks – whether in industry, banking, lobbying, media, or the upper echelons of politics. And even if they started off less than wealthy, they usually manage to accrue it pretty rapidly on the journey. If private education is terminated would that also not terminate free speech? After all private education does not have to occur in a classroom. If you actually meant private schooling such a sentiment is understandable. Yet to even eliminate that would be to be stepping on the toes of the parents of children. The idea that the elimination of private schooling is a good idea seems to me to rest on the assumption that the government can raise children better than the parents of the children can. Such an assumption is not totally unreasonable. History is filled with governments from the time of the Spartans that did a terrible job of raising the children that fell to the care of the government. On the other hand history is also filled with example of parents who did a terrible job raising their children. As far as I know the issue of who SHOULD have ultimate responsibity for children, parents or the state is an unsettled issue. I have a proposal that those who do not like their government would completely agree with. But I think that they would partially agree with it. That is that private schools would be allowed, but they could only operate (under the oversight of the government) during those hours that government schools were closed. If parents do not like what their children are being taught in government schools they are free to try to counter it, AT THEIR OWN RISK AND EXPENSE. Politics is the art of the possible. Social Democratic Parties have to negotiate a Neoliberal landscape. It’s sad that this reality constrains their freedom of action and reinforces the Neoliberal’s stranglehold on the debate but when the alternative is political oblivion and a blighted career because you cannot compromise, well what is an ambitious politician supposed to do? We need an event like the stagflation of the 1970s to break the current paradigm and a coalition of politically motivated progressives to make the case for change. I wonder what it will take? I thought the GFC would do it. I imagined the Trump election would do it too. But the Neoliberals remain in control! First, we need somebody on the inside of parliament who understands and supports the position – just one to begin with and then build from there. I particularly feel that new MP’s would be the most receptive – if you have a new MP from the 2017 intake, write to them and gauge their views. In theory any MP with a scientific background should also be more open to the evidence, although i know it doesn’t always work that way. You need voices in support on Radio 4, Question Time etc etc – it won’t happen until there are MP’s who will carry that message forward. Remember, Speakers corner is now Facebook, Youtube, Twitter etc – it only needs to go viral once and then the yoof get it and you have a base to work from. Really good comments that reveal so much more than those superficial debates we get on the ‘better’ mass media outlets like the ABC in Oz, that as far as macroeconomics is concerned, are usually by experts that really have very little credibility, that can barely get a few minor points across in the tiny amount of time allocated, where presentation seems to be more effective than substance in the minds of a confused public, participants are talked over by opponents or are cut short by narcissistic or incompetent hosts. Please note Andreas and Jennifer Labour has already entrapped itself in fiscal credibility rules. Indeed UK Labour and NZ Labour and their coalition are even more fiscally incompetent (aim for smaller deficits or even surpluses) than their Conservative oppositions in a mad neoliberal world with record levels of wealth inequity, chronically underfunded essential government services, high levels of poverty and hardship due to expensive housing and inadequate healthcare, very high ongoing levels of working poor, unemployment and underemployment and record levels of tax avoidance and evasion! I suspect the Australian situation is still the same under Bill Shorten and if Bernie Sanders fails to gain the ascendency in the US Democratic Party then that party is also likely to remain more fiscally conservative than the tax cut and military spending obsessed Republicans under Trump or whatever other corporate/evangelical sycophant replaces him. With such fiscal constraints (if they are really to be implemented?) then the ‘progressive’ side of politics will never be able to deliver very much, even with an effective reduction of tax avoidance and evasion and higher tax rates on the wealthy. Voters will again become disillusioned and the pendulum will return to the Conservatives who will also be reinvigorated by the wealthy that deeply resent being taxed. What is most critical is that the urgently needed transition to environmental sustainability and the roll back of global warming will be squandered, possibly beyond the point of no return. Bernie Sanders has supposedly dabbled with MMT by accepting advice from Stephanie Kelton and Pavlina Tcherneva so why can’t Jeremy Corbyn and other ‘progressive’ parties do the same? Is the corporate/financial/wealthy oligarchy, that currently controls a large portion of the mass media and thereby the vote of a sufficiently large portion of the wilfully ignorant and gullible electorate, dictating fiscal policy to the ‘progressive’ side of politics in exchange for being ‘allowed’ to be voted into office unimpeded by a savage attack campaign or are the traditional left Social Democrats just hopelessly incompetent? OOPPs I forgot to “Knot” my sentence. Nobody “earns” a bonus merely by delivering what they are paid (often handsomely) to deliver. If that isn’t what they’re paid for then what *are* they paid for? You’re being duped I’m afraid. Bonuses are just camouflage for looting, doled out by the looters-in-chief – first and foremost to themselves. Top bonus payouts have often been made by firms seen in hindsight to have been going down the tubes (but not before the looters have grabbed their loot and run – eg Citibank…). There are two types of Bonuses that I know of. One kind is for exeeding what you are paid to do. This is the kind that often gets abused as people use smoke and mirrors to misrepresent what they have done. Then there are bonuses for people who do something good that they are not paid to do. Therefore Bonuses can be “earned”. Richard Murphy (of Tax Justice fame, and has featured in comments here before) was at one time, said to be working with Corbyn and McDonnell in formulating their economic policies. Now he may not be pure MMT (Bill may say he isn’t MMT at all), but I’d say he was closer to MMT than the average mainstream economist. It seems that Murphy and the Labour leadership had a falling-out. I don’t know details, but somewhere or other, McDonnell was quoted as saying that Murphy’s macroeconomics was not up to scratch (not his exact words, but basically, he didn’t rate Murphy, and he also downplayed Murphy’s role with respect to Labour’s policies). Now McDonnell is supposed to be a trained economist, but in what sort of economics? I’d suggest it’s pretty mainstream, especially if he can come out with that godawful fiscal credibility rule. FWIW, I sent both Corbyn and McDonnell copies of Bill’s latest book. I haven’t received an acknowledgement. Maybe they never received them; maybe they are too busy; maybe they are not interested. Who knows. I also sent one to Caroline Lucas MP, co-leader of the Green Party (since I happen to be a member of the UK GP). Also no acknowledgement. (But then maybe she is cross with me after I sent her an email strongly disagreeing with GP policy on the EU). I keep meaning to send or give a copy to our local MP, who was new in the 2017 intake. She’s a LibDem, so I don’t hold out too much hope, but we have to try. Mike Ellwood thanks. I’m a member of the Australian Greens and also do my bit to enlighten others to MMT as well as a carbon tax with full refund to citizens as per James Hansen’s recommendations. Carbon cap and trade is going to be a monumental scam and Goldman Sachs and Al Gore are major promoters of this approach.